That’s Pablo Cuevas on the left there. He got mad and staged a protest at Wimbledon because the umpire wouldn’t let him take a pee. Yesterday, Cuevas and his doubles partner Marcel Granollers dropped a grueling five-set match with Jonny Marray and Adil Shamisan. The match took about four hours, and unfortunately, Cuevas and Granollers used up their two bathroom breaks too early. Cuevas requested a third break, and French umpire Aurelie Tourte refused and penalized Cuevas’ team after he threatened to piss in a can. After a double fault, Cuevas got docked a point for smashing the ball out of the court in frustration. He and his teammate were so mad that they went and sat on their bench in protest for over 10 minutes. They returned to the game facing triple match point, and they promptly lost. 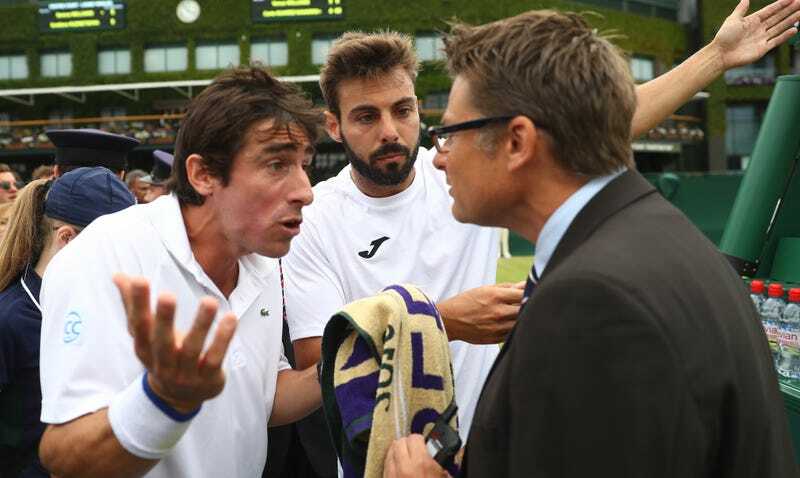 One witness claimed that Cuevas had urinated into the can, under the cover of a towel, but Wimbledon officials said on Monday night that “no urination was involved” although a code violation was issued for unsportsmanlike conduct at the time.